We use water for cleaning so many things. It efficiently wipes and washes away a great deal of the dirt and spills that occur around the house. But how much can just water or even soapy water do? It often won’t remove the tough stains built up on your kitchen countertop, nor can it clean your toilet so that it’s germ-free. Compared to water (H2O), hydrogen peroxide (H2O2) has an added molecule of oxygen that gives it an advantage point. 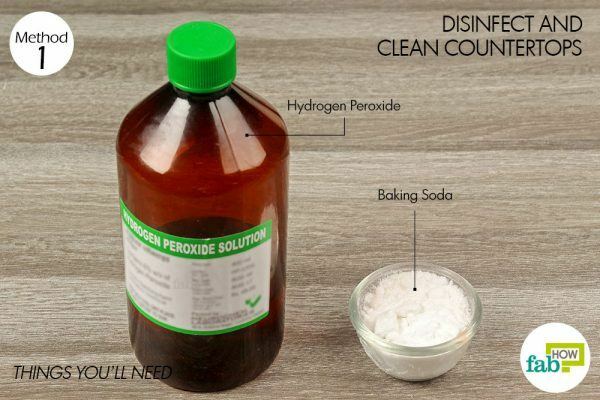 Hydrogen peroxide can easily clean and sanitize your toilet and make your countertop shiny again. It can clean your dirty chair fabric and get a musty smell out of your carpet, closet and cupboards. Phew. So much from a product that is readily available at your nearest grocery or drug store and incredibly cheap, too. But availability and low-cost are of secondary importance when it comes to cleaning up your house. What’s more important is you can use this solution anywhere – from the kitchen to the bathroom, from the laundry to your garden. The multipurpose hydrogen peroxide is the go-to solution for all your cleaning needs. Below are various ways you can use hydrogen peroxide to clean nearly anything and everything around your house. 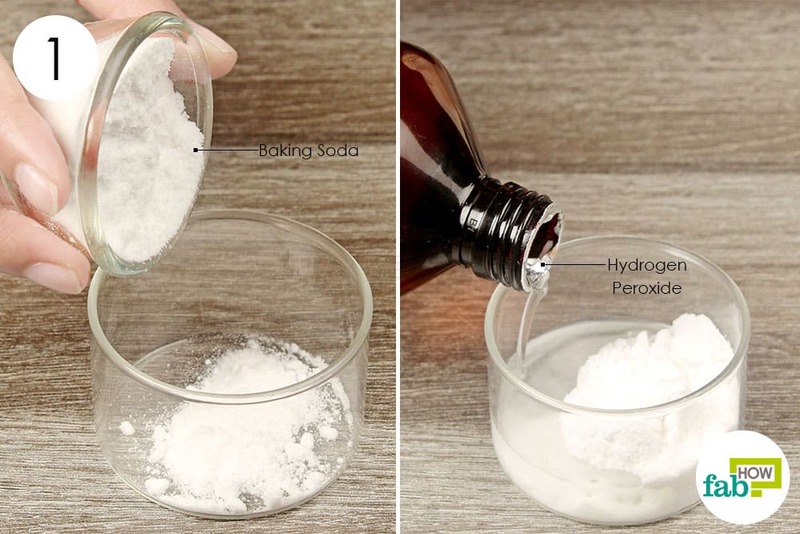 Using 3% hydrogen peroxide is advisable for these cleaning methods. Most stores carry this concentration. Is your kitchen countertop losing its shine or is it completely covered with remnants of greasy food and pasta sauce? Worry not when hydrogen peroxide is here. Hydrogen peroxide along with its sidekick baking soda works magic to disinfect and clean countertops that have seen better days. Put 1 tablespoon of baking soda in a small dish. Add about 2 tablespoons of hydrogen peroxide to it. Mix it well to form a thick paste. Make sure the paste is not runny or else the mixture will start to run off after applying it on the countertops. Use a sponge or a rag to scrub the paste around on your countertop, then let it stand for some time. Clean the paste and loosened grime off with warm water. 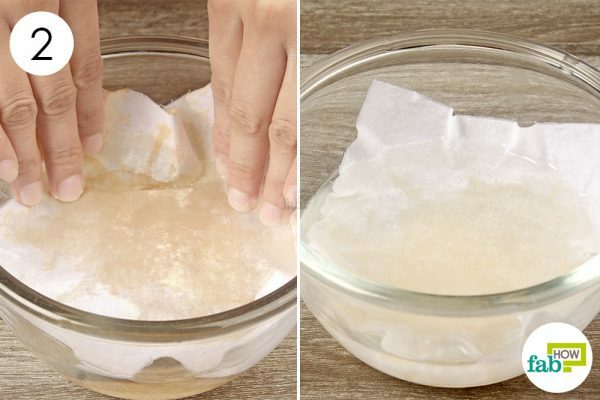 If there are stubborn stains, let the paste sit overnight and clean it up in the morning. 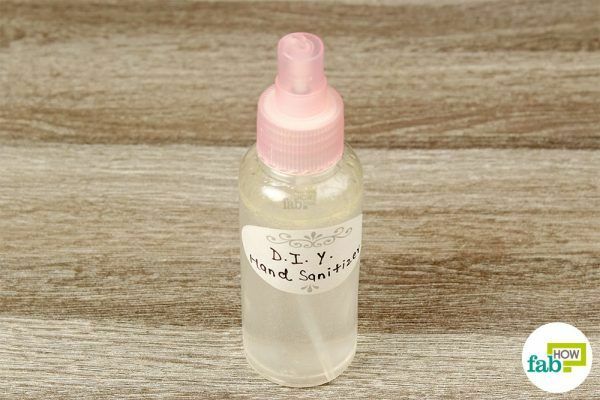 Making an all-purpose-cleaner with hydrogen peroxide is child’s play, and the rewards it generates are awesome. Be it your baking dishes, lunchboxes or burned pots, anything and everything in your kitchen can be cleaned and disinfected with this solution. It’s the simplest (and the best) thing you’ll ever do to clean those greasy aluminum baking trays that have had a burnt mark since forever. 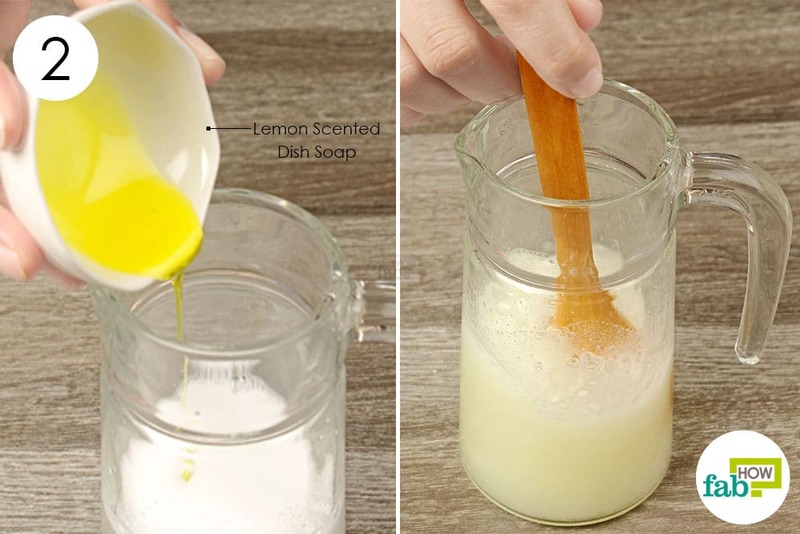 Really easy to make and use, this will forever change the way you clean your kitchen. 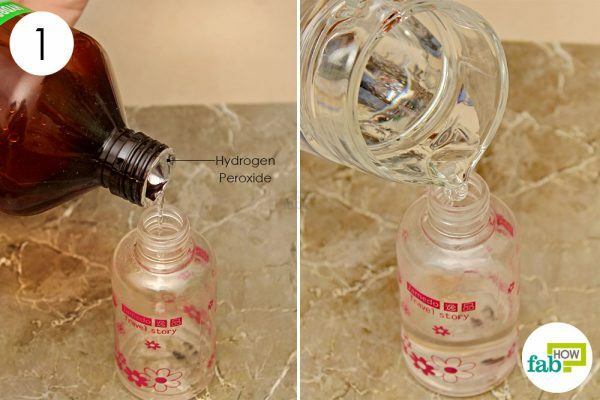 Pour 1 cup of hydrogen peroxide along with 1 cup of water into a spray bottle. If you’re using a large spray bottle, you can adjust the quantities but make sure the ratio of hydrogen peroxide to water is 1:1. Using hydrogen peroxide directly on aluminum trays, lunchboxes, burned pots and other items may lead to rust spots. Diluting it with water will prevent rust from forming. Spray the solution on the areas you need to clean. Use a sponge or a rag to scrub the area clean. Are you one of those cooks who love pets but are scared to pet them (because of all the germs), and each time you do pet them, you end up washing your hands (same reason again)? Hydrogen peroxide is a blessing for pet owners (and food lovers). 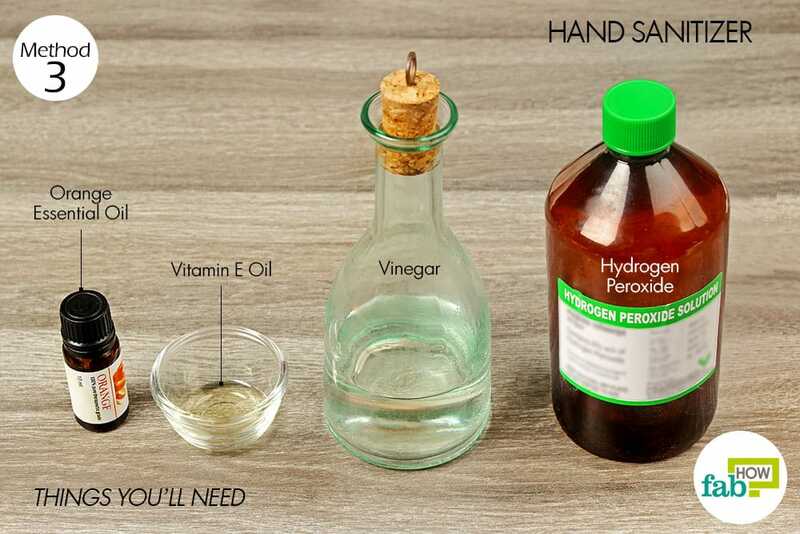 The all-natural way to clean your hands, hydrogen peroxide along with vinegar and vitamin E will clean your hands of germs and give them the soft touch they require. Easy-to-make, keep it handy for the next time you pet your dog and enter the kitchen. These quantities are for a 2-ounce spray bottle. You can use a bigger bottle and adjust the ingredients proportionately. 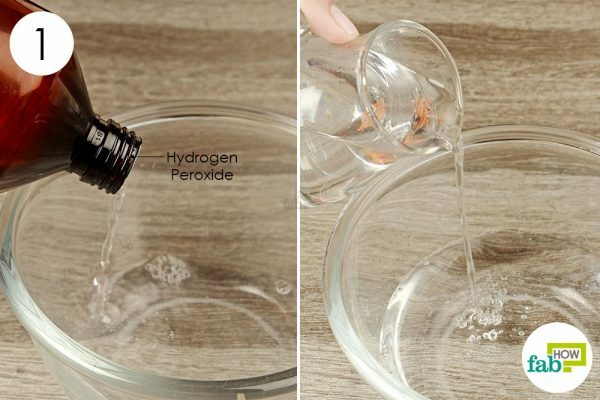 Pour 1½ tablespoons of hydrogen peroxide into a spray bottle. Add 2 tablespoons of vinegar to it. Top it with 2 teaspoons of vitamin E oil. 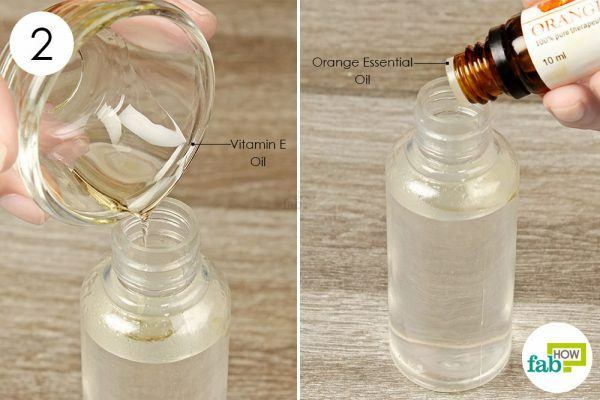 Add 3 or 4 drops of orange essential oil to it. Shake it well. Apply the sanitizer on your hands to clean them of any bacteria and give them a tangy citrusy smell. Shake the solution once before each time you use it. Most would agree that cleaning toilets is one of the hardest cleaning jobs. Toilet bowls are a tough spot and getting rid of those germ-filled potholes is a task no one wants to do. But in the end, it’s your home and you are the chosen one that has to clean it anyway. It’s no reason to be sad about. Thanks to hydrogen peroxide, it won’t be a tough job anymore. 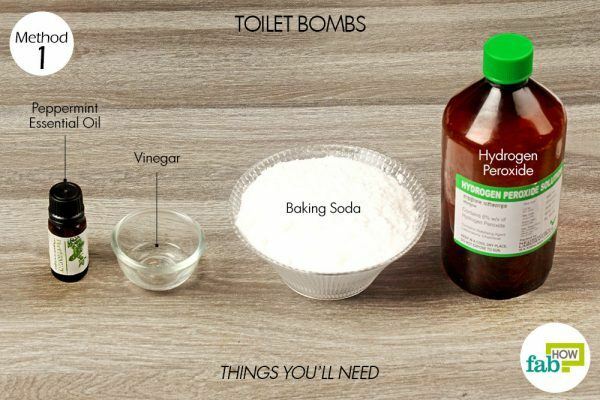 Bombing the germs in your toilet with hydrogen peroxide toilet bombs actually makes cleaning fun. Pour 2 tablespoons of hydrogen peroxide into a spray bottle. Add 1 teaspoon of vinegar. Add 3 or 4 drops of peppermint essential oil as well. Put the nozzle back on and shake it well to mix the ingredients. 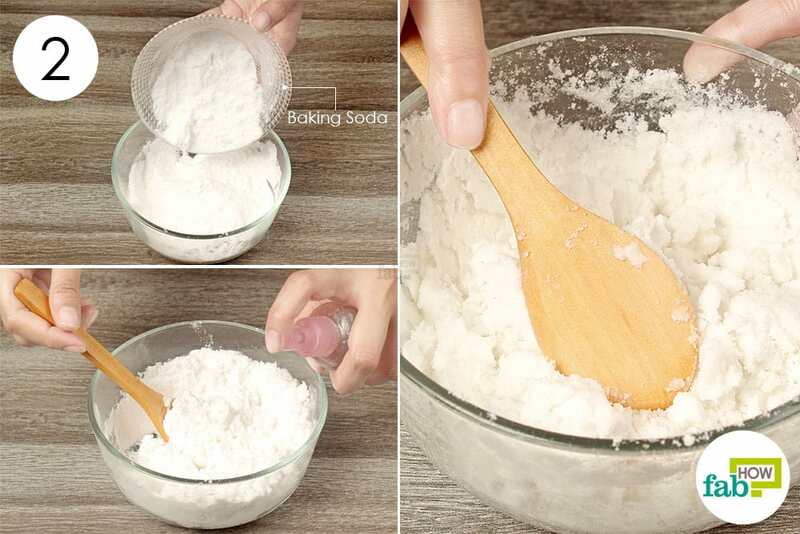 Put 1½ cups of baking soda in a bowl. Gradually spray the hydrogen peroxide solution into it, mixing it in as you go. It should be wet enough, but not too runny or else it will not dry up easily. 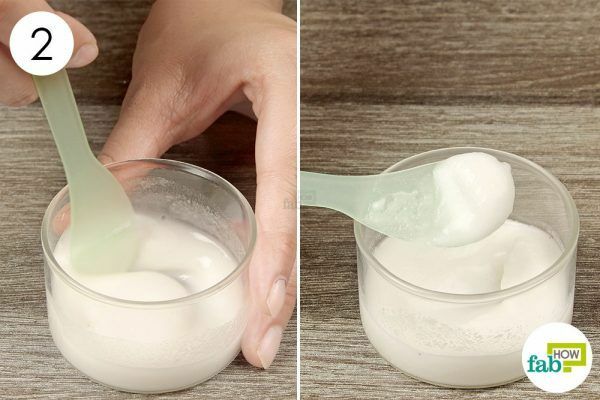 Scoop up the baking soda-hydrogen peroxide mixture to form it into semi-round balls. Instead of scooping the mixture with a spoon, you can use silicone molds of different shapes, just to make the bombs look a little more exciting and fun. 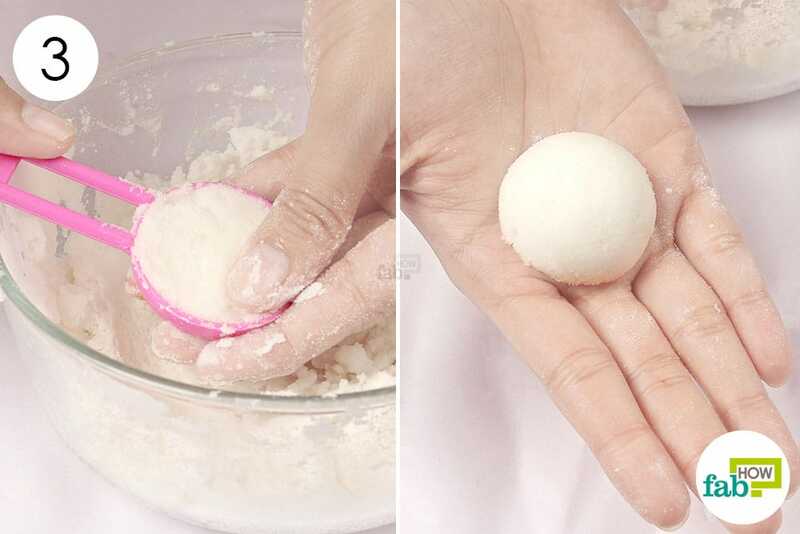 Let the semi-round balls dry for 4 to 5 hours. 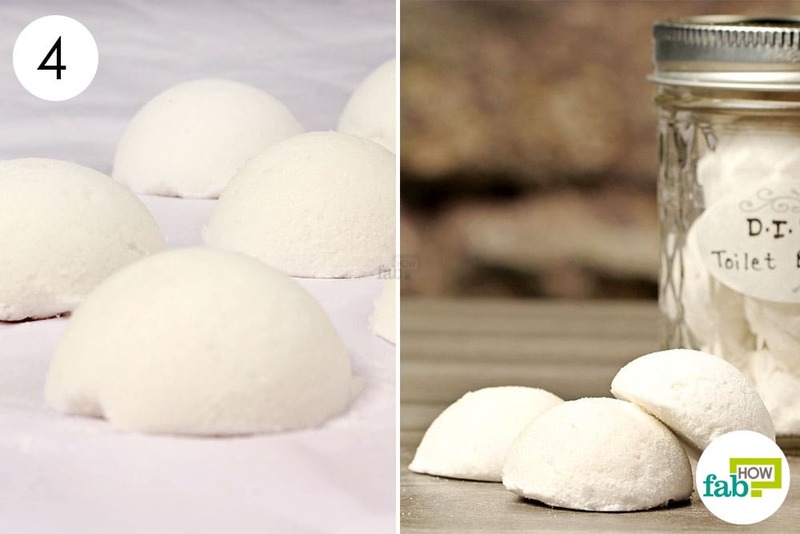 Once they are dry, use as cleaning bombs for your toilet. Let the bomb fizzle for a minute, then leave it in the toilet for about 10 minutes. Use a toilet brush to rub and scrub the toilet bowl clean, then flush the bomb away. You’ll see a shiny, clean toilet, and the peppermint essential oil leaves it smelling fresh. This recipe makes enough toilet bombs to last for a month or longer. Store them in a dark place in an airtight container and use as needed. No matter how well maintained your bathroom is, the water stains left on the white marble tiles can make the whole room look grungy and leave your guests with a bad impression. Not that you don’t try your best to remove them. They just stay like an unwelcomed guest. Hydrogen peroxide acts as a bleaching agent and helps remove the yellow stains deposited on marble tiles and gives your bathroom the shine it needs to make a lasting impression. Pour a little hydrogen peroxide on a paper towel and cover the stained area with it. 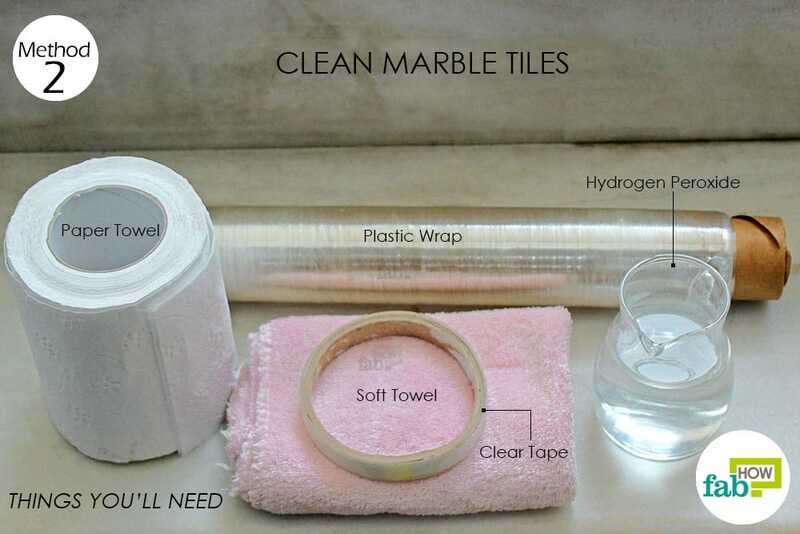 Put a layer of plastic wrap over the paper towel and tape the edges to the marble tile. This will ensure it stays on the wall for the desired time. Let it sit for 24 to 48 hours, depending on how tough the stains are. 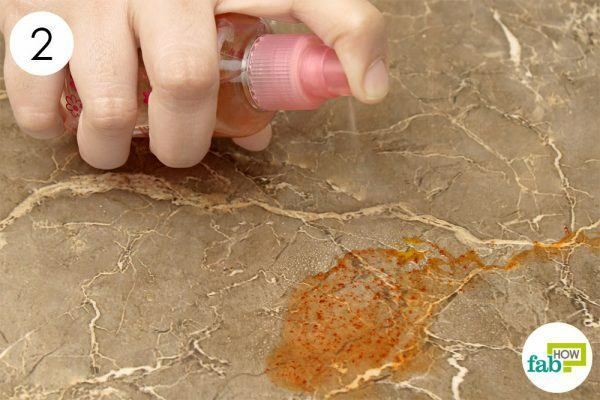 If cleaning colored tile, conduct a spot test first to be sure the colored marble does not fade. Remove the plastic wrap after the desired time. 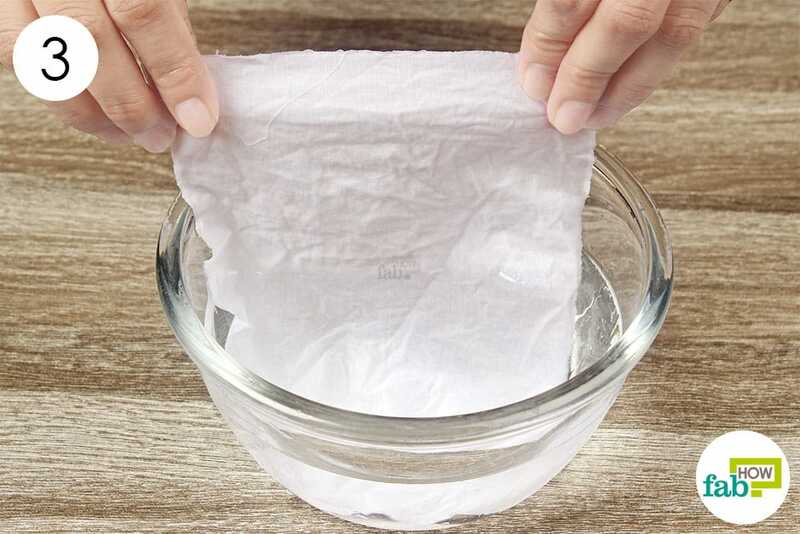 Remove the paper towel and wipe the surface with a clean towel. Notice the stains are gone and the marble is shiny. If the stains remain, repeat the process again. So you have granite in your bathroom instead of marble, and now you’re wondering how would you clean that? You need not worry. 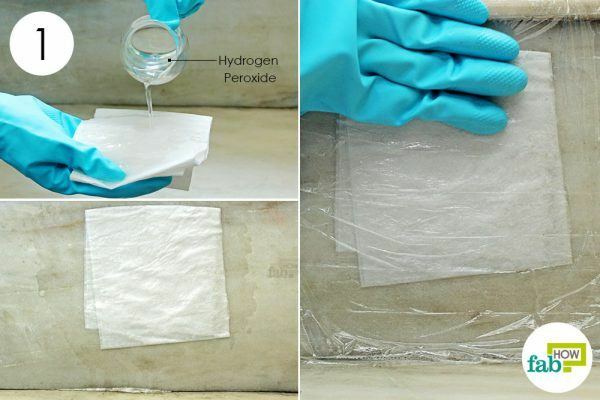 Hydrogen peroxide has a solution to everything. Hydrogen peroxide cuts stains off the granite too, and the good part – without much hassle. 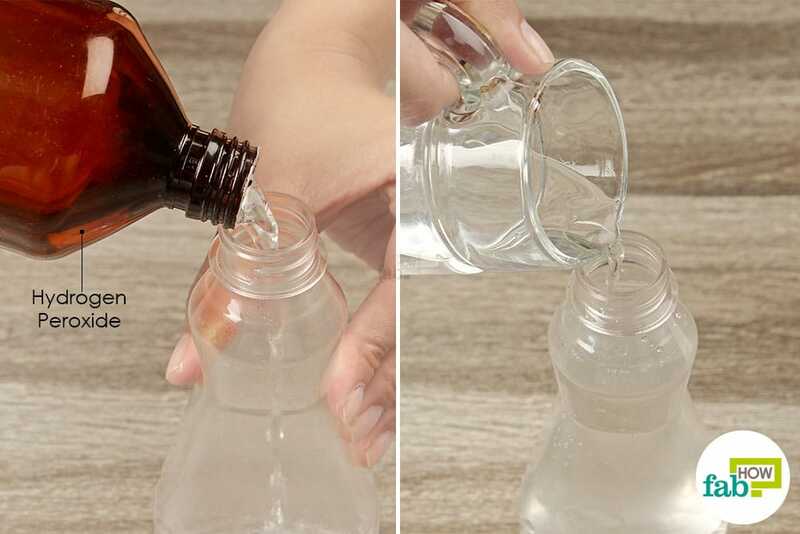 Pour 1 tablespoon of hydrogen peroxide into a spray bottle. Add 1 cup of water to dilute it. Put the nozzle back on the bottle and shake it once. Spray a few sprays of the solution on the area that needs to be cleaned. Let it sit for about 30 minutes to allow the hydrogen peroxide to do its work. 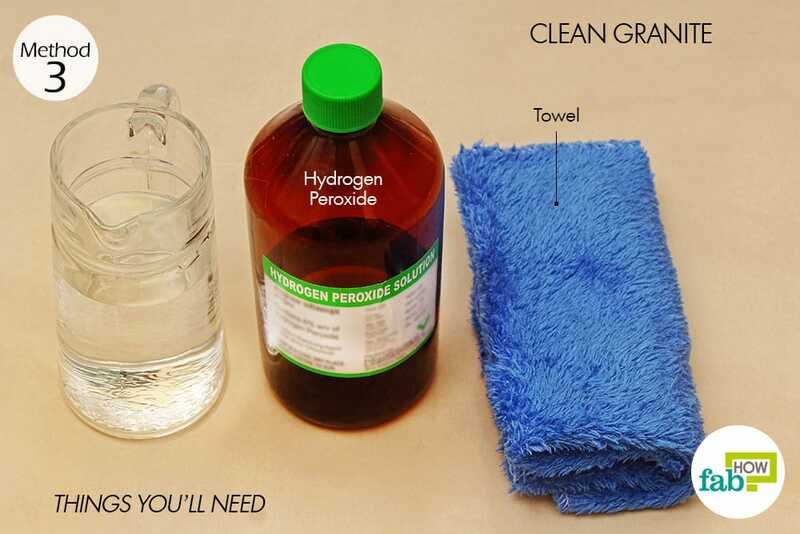 Use a clean towel to wipe up the hydrogen peroxide, applying a little pressure to wipe off the stain along with it. Your granite tiles or countertop should be sparkling clean now. Do you have a hard time keeping those white clothes ‘white’? Well, hydrogen peroxide can help you here, too. Hydrogen peroxide enhances the oxidation process (due to the presence of that extra oxygen molecule), which helps bring a new whiteness to your dull white clothes. Not only does it whiten your white clothes, it also makes them shinier. 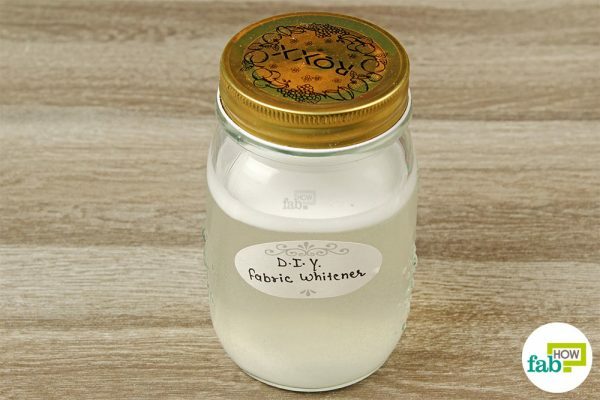 Find an airtight jar in which to prepare your fabric whitener. 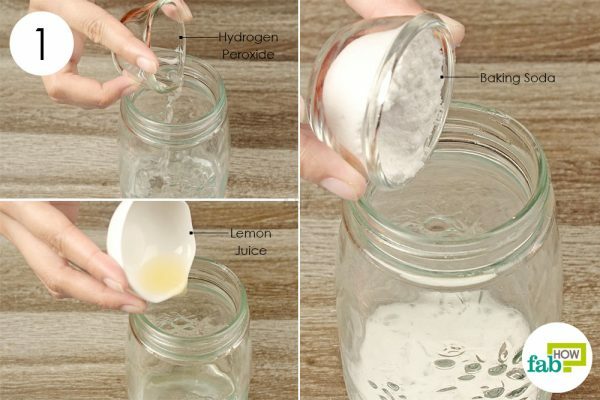 Pour 2 tablespoons of hydrogen peroxide into the jar. Add 2 teaspoons of lemon juice. Add 2 or 3 drops of orange essential oil. 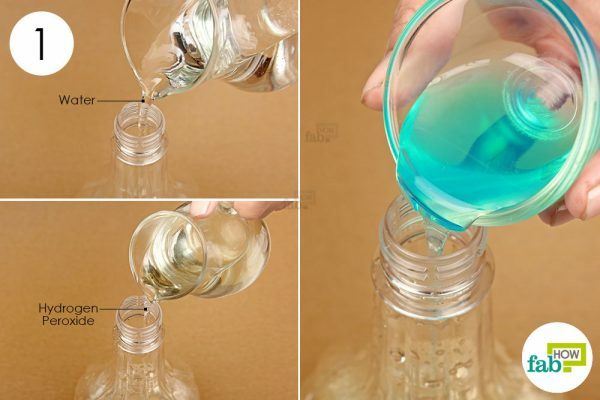 Pour 1 cup of water into the jar. Stir the ingredients well. 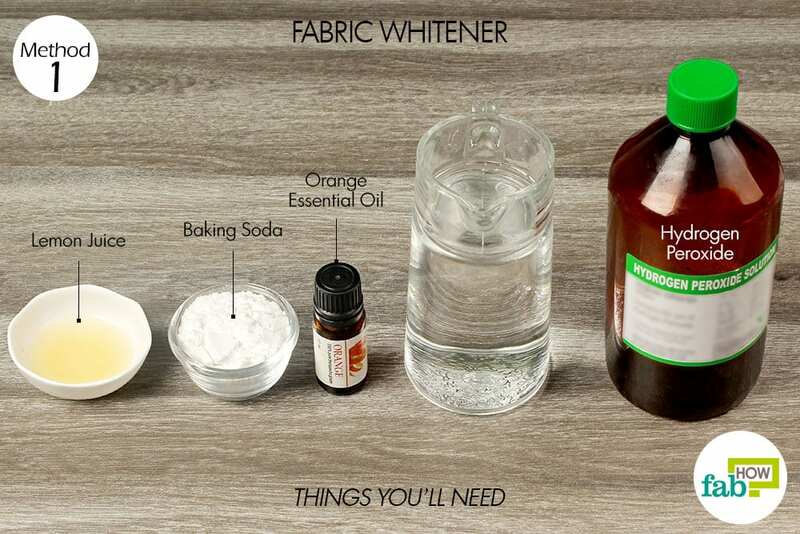 Your fabric whitener is ready. Stir the solution once before using it. Soak your whites in the fabric whitener for 5 to 10 minutes as a pre-treatment. Rinse and wash the clothes thoroughly afterwards. If you have any solution left, keep it in the airtight jar for future use. Make sure that you use an airtight jar, since essential oils and hydrogen peroxide tend to evaporate when exposed to air. Did you accidentally cut your finger and the blood dripped all over the carpet before you could get a bandage on it? 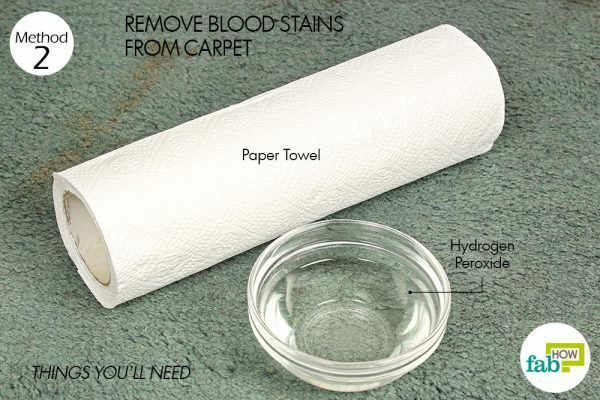 Say it or not, blood stains are the toughest stains to get out of carpet. Even after it dries and you’ve vacuumed up a good portion of the stain, they always leave a dark spot that’s hard not to notice. 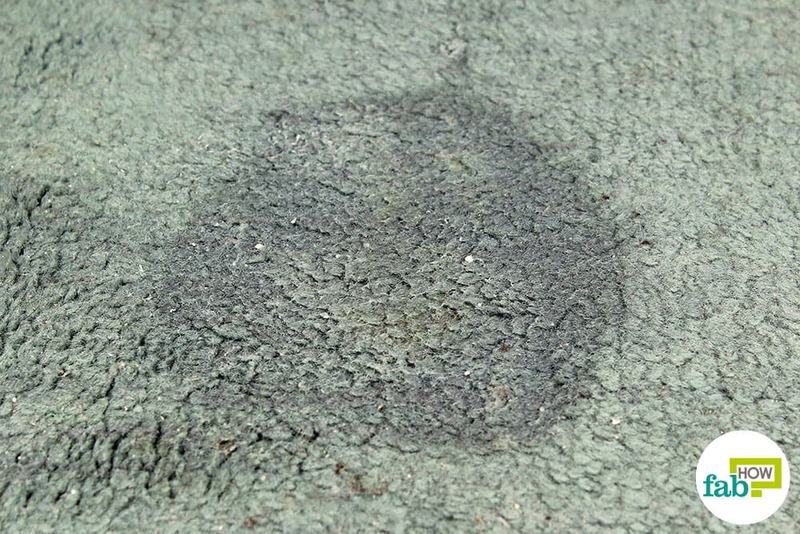 Hydrogen peroxide bleaches the carpet and cleans the bloody mark out very easily. When you’re done, you won’t even know it was ever there. Pour hydrogen peroxide on the blood stain on the carpet and let it settle. It will start to bubble and fizzle, but don’t worry. It is merely an indication that hydrogen peroxide is breaking up the stains and working. 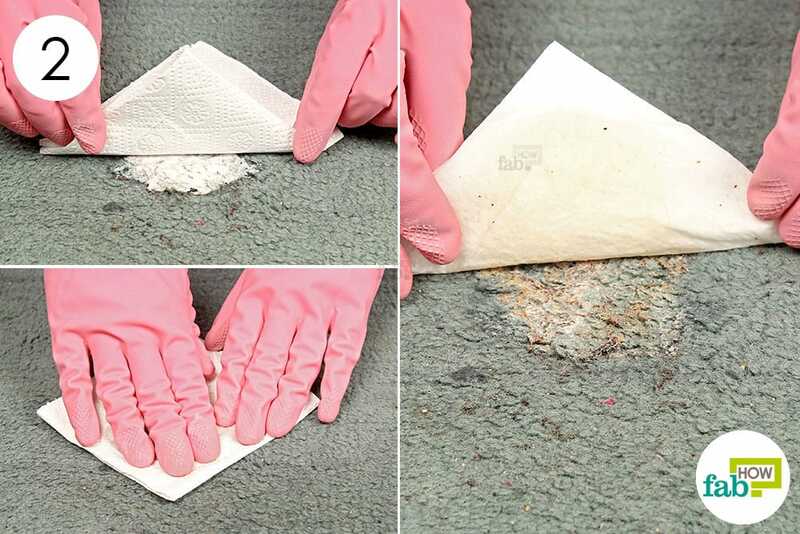 Blot the carpet with paper towels to soak up all the moisture from the area treated with hydrogen peroxide. You’ll notice the blood stain is lightening. Do not rub the area, as it may damage your carpet. Repeat the process until the blood stain is no longer visible. Blot up any remaining moisture, then allow the carpet to air-dry completely before walking on it. A strong bleaching agent, hydrogen peroxide can lift tea (and coffee) stains out of your favorite fabric very easily. 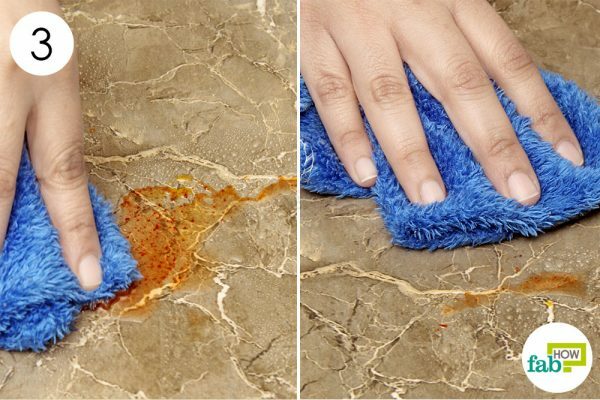 Highly effective and used by many, this is a sure-shot method for cleaning stains. The extra oxygen molecule in hydrogen peroxide makes it a powerful cleaning agent and leaves your clothes white as new. It can also be used on colored fabric, but do a spot test first. Pour 1 teaspoon of hydrogen peroxide into a bowl. If working with colored fabric, do a spot test before proceeding to be sure it doesn’t cause the color to bleed or fade. Fully immerse the tea-stained area in the solution, and rub gently to help break up the stain. Let the fabric sit in the solution for about 20 minutes. Take the fabric out, and thoroughly rinse it with fresh water. 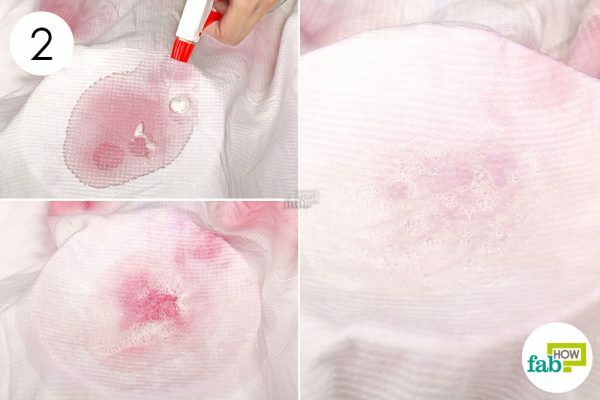 Wash the fabric with detergent as you normally would. 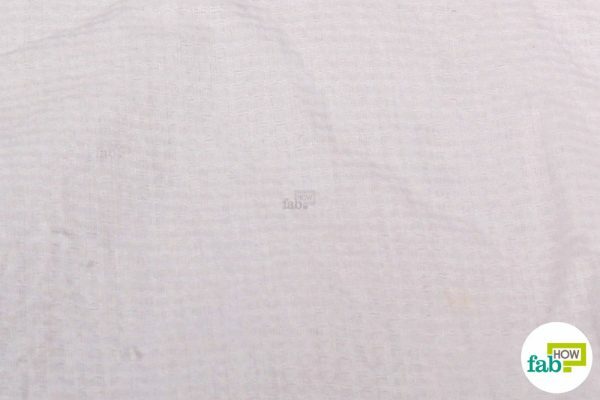 Once dry, you’ll notice that the stain is gone and your fabric is as good as new. 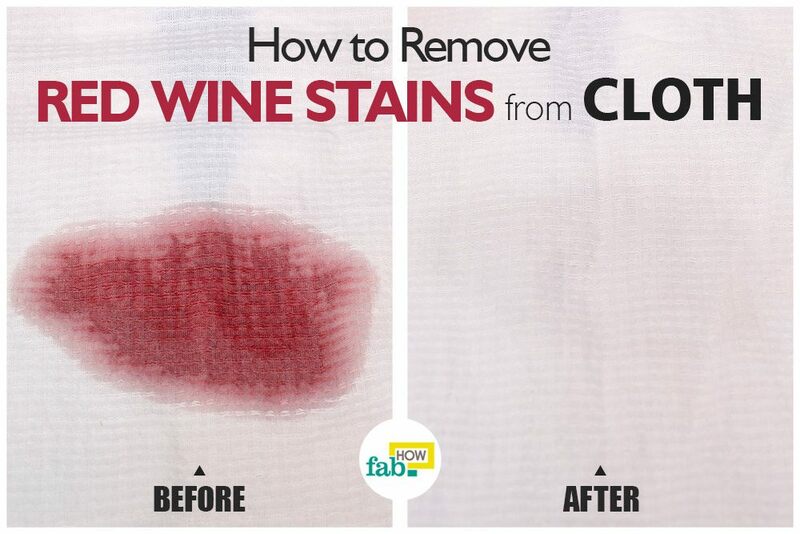 Wine stains are like tea and coffee stains – easy to come, hard to go. 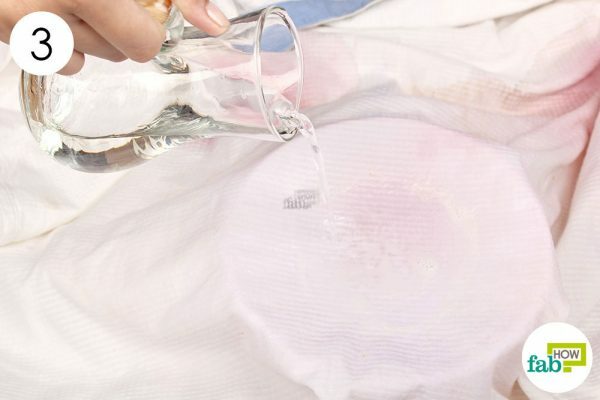 Wine stains that have dried onto your clothing or tablecloth can seem impossible to deal with. 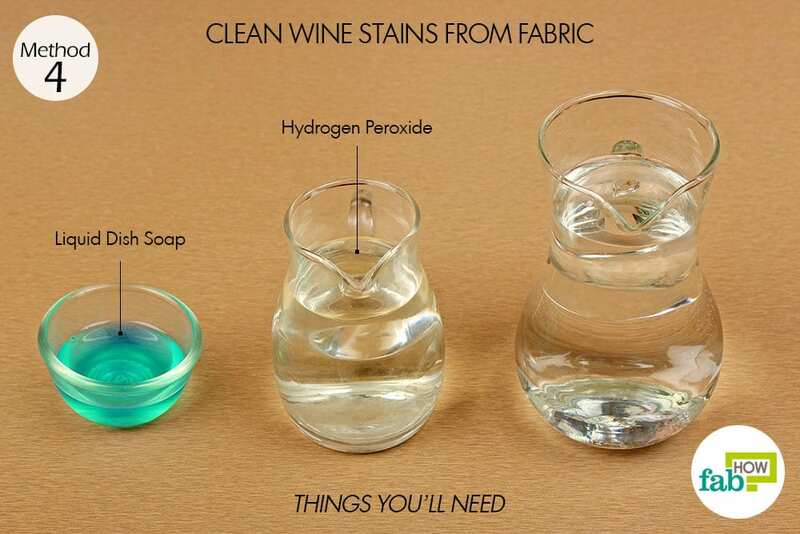 But hydrogen peroxide, the ultimate bleaching agent, can easily remove those tough, dried-up wine stains. Pour 2 teaspoons tablespoons of hydrogen peroxide into a spray bottle. Add 2 teaspoons of liquid dish soap to it. Pour 1 cup of water into the bottle as well. Put the nozzle back on the spray bottle. 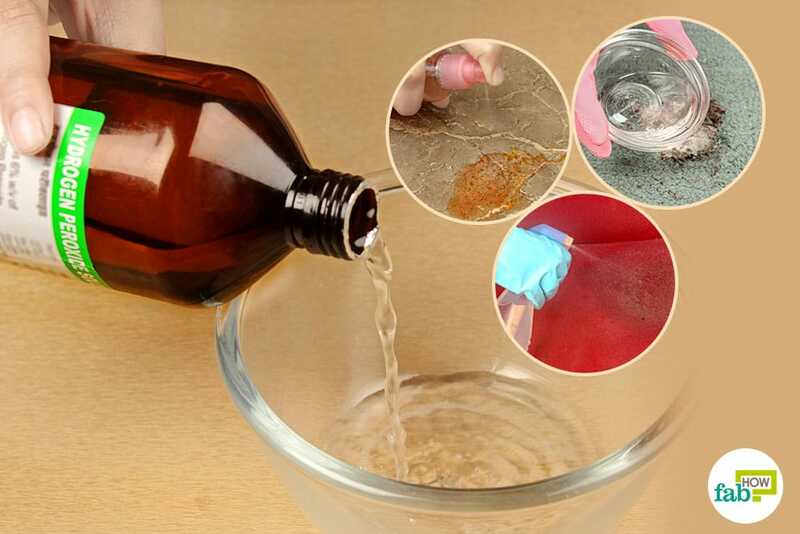 To ensure that the soap and hydrogen peroxide are completely mixed into the water, shake it well. Spray the solution on the wine-stained area. If the stain remains after 10 minutes, spray the solution again and wait another 10 minutes. Repeat the process until the stain lightens. After you see the stain lightening, thoroughly rinse the fabric with water. Wash it well with detergent thereafter. A musty smell is so unwelcoming that even you don’t want to enter your home! But with hydrogen peroxide coming into play, it will no longer be a problem. 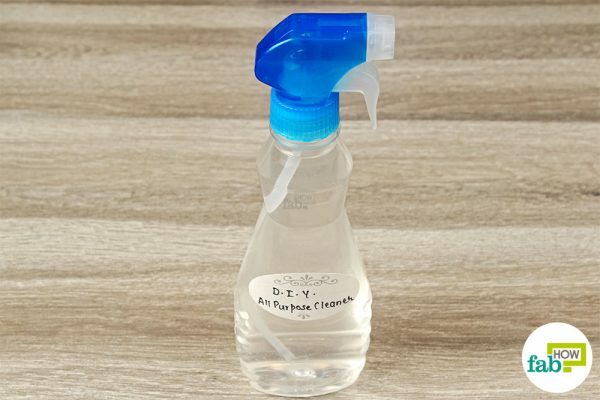 Hydrogen peroxide, combined with lemon-scented dish soap and a couple other ingredients, will help remove the odor from carpet, cupboards and curtains, among everything else, while leaving your house smelling lemony fresh. It works on wood furniture, too. 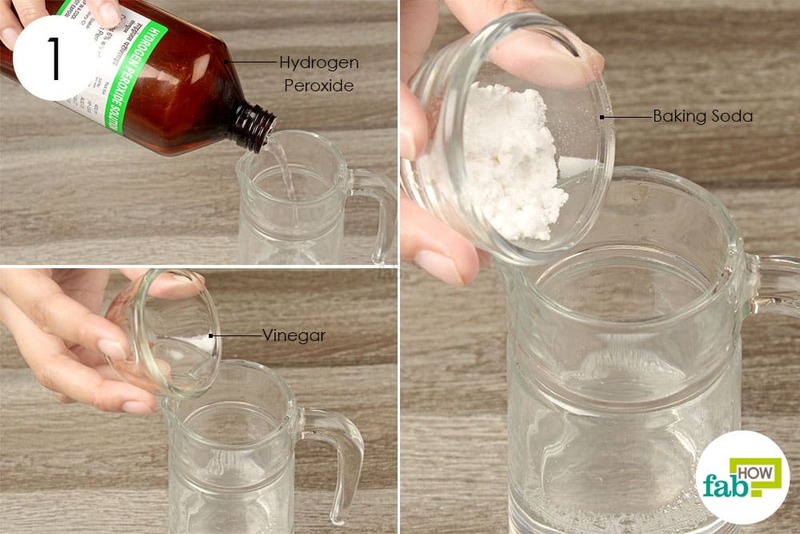 Pour 2 tablespoons of hydrogen peroxide into a jar. Add 1 tablespoon of vinegar as well. Add 1 teaspoon of lemon-scented dish soap to the jar. 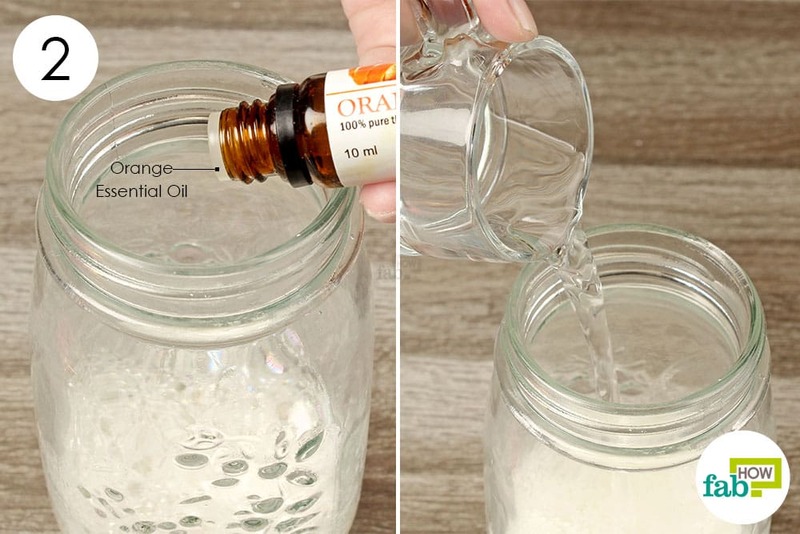 You can also use orange-scented dish soap (or basically any dish soap with a citrus fragrance) for this purpose. 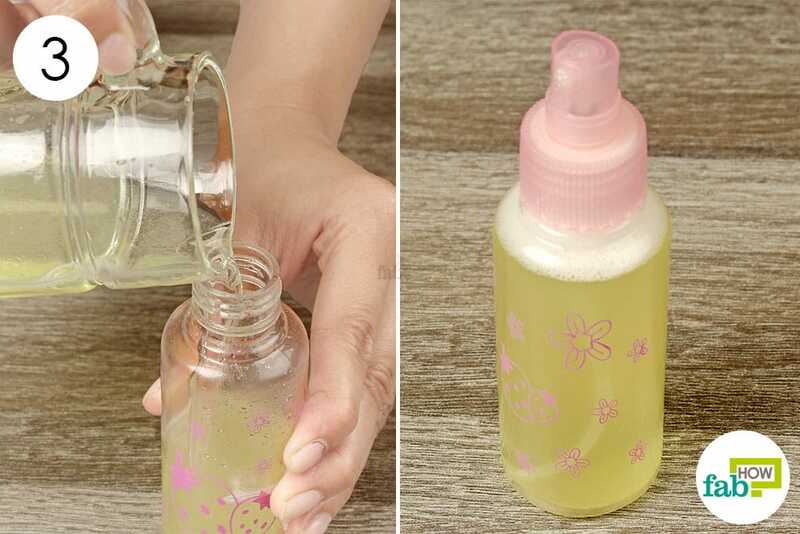 Pour the solution into a spray bottle for ease of use. Do a spot test on a small section of the area you want to deodorize, and check to see if it causes any reaction like fading the color of the carpet or curtains. If the spot test comes out fine, spray the solution all over the item or area that smells musty and allow it to dry. Once it dries, it will turn into powder. You can then vacuum up the powder. 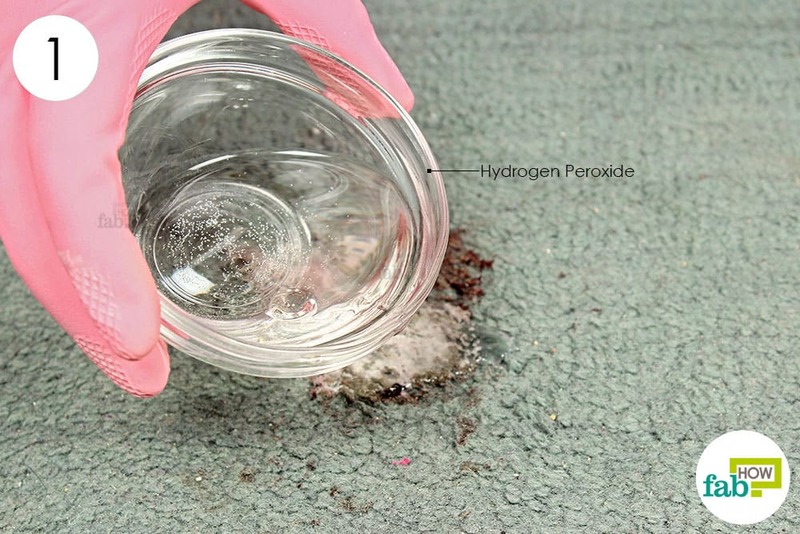 Not only does hydrogen peroxide work inside the house, it’s helpful outside, too. It keeps your plants free of pests and fungi that would otherwise inhibit growth or even damage them. Add 1 cup of hydrogen peroxide to it. 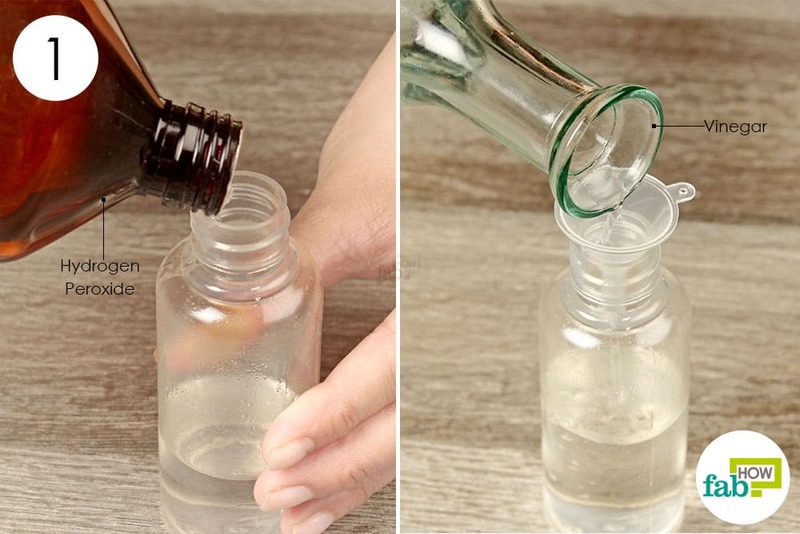 Shake the bottle to thoroughly mix the ingredients and properly dilute the hydrogen peroxide. Spray it on the plants in your garden to ensure healthy growth by keeping away pests that may harm them. The same formula also keeps plants fungus-free, so that they grow into greener and bigger plants. Just spray it on budding plants and watch them grow. You can use any citrus essential oil, such as lemon in place of orange, in the methods above. Citrus essential oils not only give your house a fresh smell, they also revitalize and bring new energy to your home. You can also clean your refrigerator, both inside and out, with the all-purpose-cleaner. It will clean away any mold budding in the refrigerator without damaging the appliance. Clean windows and mirrors with the all-purpose-cleaner. 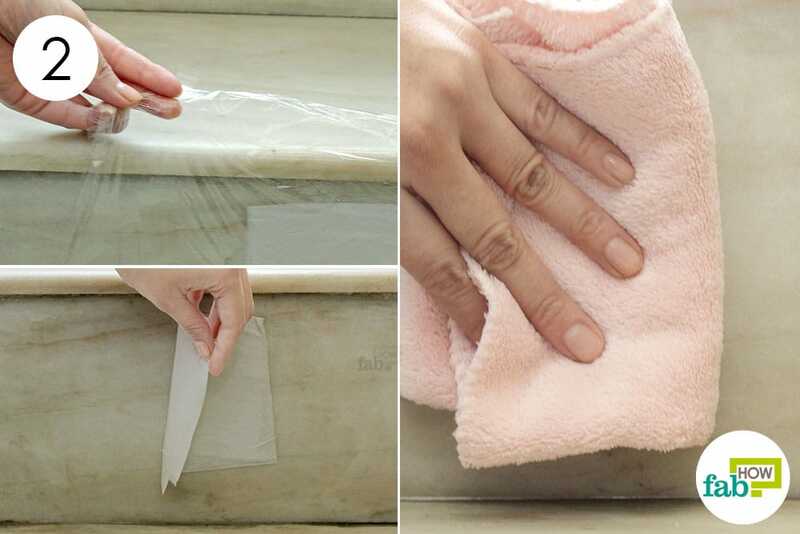 Just spray and wipe away the solution with a lint-free cloth to give them a new shine. The solution used for cleaning and disinfecting countertops can also be used for disinfecting cutting boards and ensures that you enjoy a germ-free meal. Spray the solution on the cutting board and clean it up thoroughly with running water. You can use the toilet bombs to clean your bathtub, too. Simply fill the bathtub with water, throw in a few bombs and let them do their work for a few minutes. Rub, scrub and rinse. 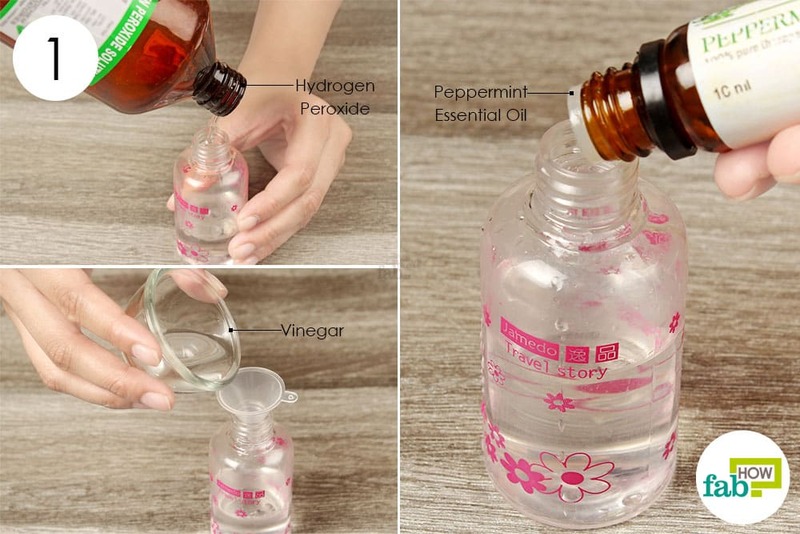 Mix equal amounts of water and hydrogen peroxide in a spray bottle. Use it to clean up mold and mildew that often forms in the corners of the bathroom or bathtub tiling. After hosting a fun party, you may wake up to find red wine spilled on the walls of your house. You can use hydrogen peroxide to remove red wine stains from walls. If you have mold or mildew building up on the walls or furniture in your backyard, use straight hydrogen peroxide on a cloth to wipe it up. 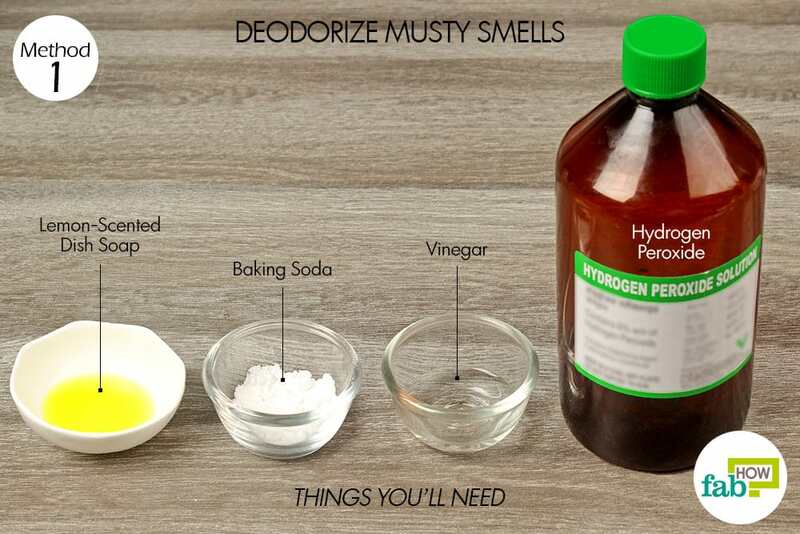 The white marks left by deodorant on your dark-colored clothes don’t always come out in the wash, but you can use hydrogen peroxide to remove deodorant stains from your clothes very easily. this is very dangerous! never mix hydrogen peroxide with vinegar! dangerous and corrosive acid is made with this! also never put hydrogen peroxide in a clean container. it is sensitive to light and becomes unstable. lastly never put it on stone like marble…corrosive and will etch surface. It’s a correct observation of mixing hydrogen peroxide with vinegar IF done with the concentrated one. If by hydrogen peroxide you mean a low concentration in water (e.g. 6%) then yes, you are unlikely to come to harm. Higher concentrations are liable to give irritating fumes including peroxyacetic acid. The highest concentrations of hydrogen peroxide and acetic acid (the active ingredient in vinegar -much more corrosive to human tissue and flammable) mean putting an oxidizing agent with a fuel and could ignite explosively. We thus always advise the users to use 3% hydrogen peroxide concentration for cleaning and other purposes. Is the 3% hydrogen peroxide the result after mixing all the ingredients or the specification or concentration of the raw or ex-store hydrogen peroxide? You can find hydrogen peroxide with this specific concentration (3%) in the local pharmacy or an online store as well. Is there some kind of use with hydro peroxide to keep a neighbors dog from peeing on my out side garbage can and part of the sidewalk that is molding because of it?